Once an engagement is announced, the next thing that everyone starts asking is, "when is the wedding?" 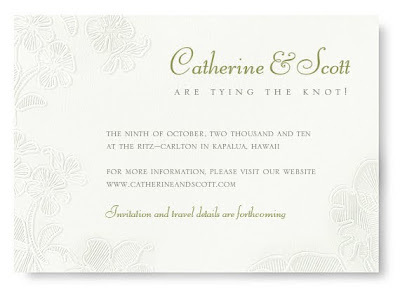 Save the Date cards inform your guests of your future wedding plans. Usually sent 4-6 months in advance or up to 12 months for destination weddings, Save the Dates also set the tone and style of your wedding—formal, informal, destination, civil or religious. The design on this Embossed Alencon Lace Save the Date and Embossed Alencon Light Green Wedding Gatefold Invitation is inspired by Vera Wang's use of Alencon Lace in her gowns and fashion collections. 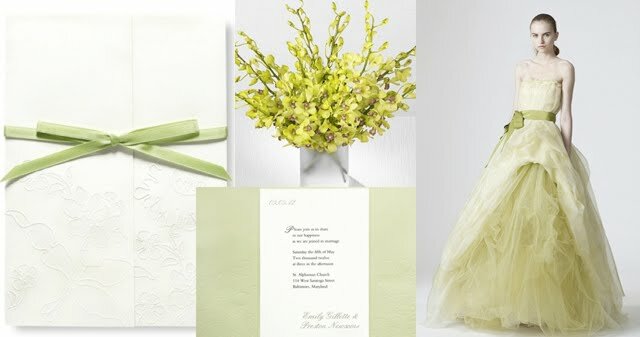 You can imagine this elegant Save the Date setting the tone for a perfectly romantic springtime wedding!